Back in July 2011 I posted a tian recipe which is super tasty and has been requested by dinner guests ever since. I will continue to love it and make it but this week I had a brilliant idea. Why not make tian boats that use one of the main ingredients, red pepper, as the vessel in which to bake these layered Mediterranean vegetables? I noted in the original post that a tian is a conical earthenware cooking vessel used in the Alpes-Maritimes area of France. But if you don’t live in the Alpes-Maritimes area of France, or you can’t source said conical earthenware vessel, or you are just plan lazy and want to take a short-cut, red peppers work just as well. Layered zucchini, eggplant, basil, garlic tomatoes, shallots, and thyme were never so easy or delicious. Or pretty. 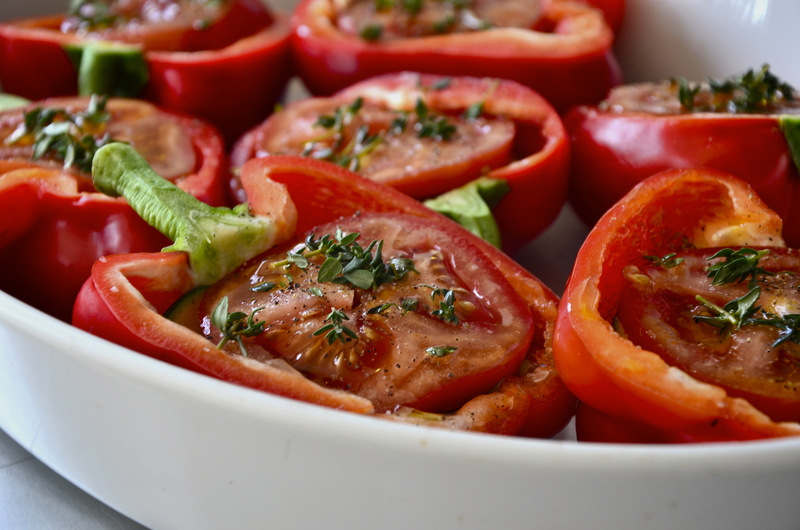 Place red pepper halves in an oven proof baking dish open side up. Layer all your ingredients – shallots, zucchini, tomatoes, garlic, eggplant, and basil one by one – finishing with a slice of tomato. (I placed them in order of shallots, zucchini, tomato, basil, eggplant, garlic, tomato). Depending on the size of your red peppers, you may need to double up layers or keep them pretty thin. Once layers are complete, drizzle each boat with olive oil. Add sea salt and pepper to taste. Sprinkle a little bit of organic cane sugar on each, and then finish with a few sprigs of thyme. Bake in the oven for about 25 minutes or until the boats are soft and the edges of the red pepper are slightly browned. Serve immediately with your favourite grain – quinoa is nice particularly in spring. I’m invoking the spring. It’s April 1st and for many of you, you will be skipping amongst the tulips. But for us here in Toronto it’s windy, and cold, and – yes – snowing. Grumpiness abounds. So, to invoke the spring I’ve decided to clean out my fridge of all the winter hangers-on like rutabaga, carrots, and potatoes. Deborah Madison in her new (fabulous!) cookbook Vegetable Literacy, has the perfect recipe for these 3 rooty vegetables that are often relied upon to get us through the darkness of our darkest months. “Mustard grounds the sweetness of the vegetables” and a lovely parsley sauce contributes to the prayer for sun, warmth, and longer days with its green intensity and fresh springy taste. It’s goodbye winter. Hello spring. Bring on the fresh asparagus, spinach, and baby greens … after I finish another serving of the stew. Heat the oil in a wide saute pan with a lid over medium heat. 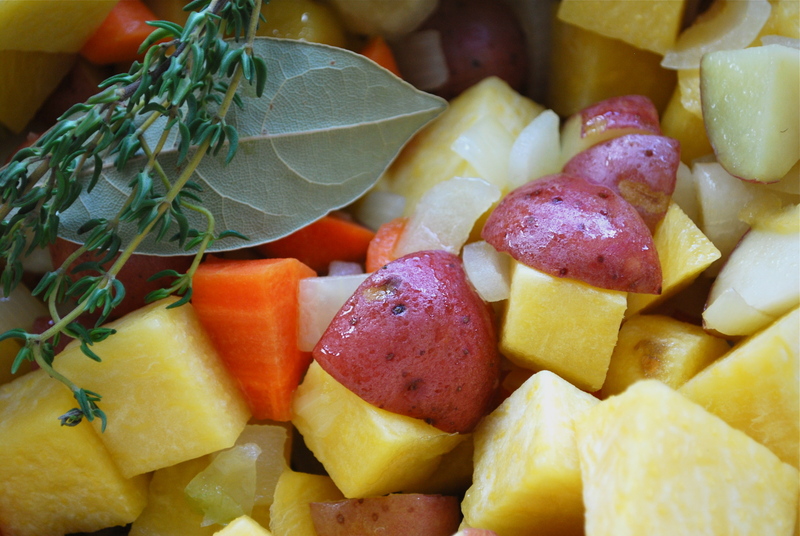 Add the onion, rutabagas, potatoes, carrots, thyme, and bay leaves, turn to coat, and season with 1 teaspoon salt. Cook over medium heat for 10 minutes, stirring occasionally. Add the water, cover, turn the heat to medium low, and cook for 20 minutes. Check to see how tender the vegetables are and how much liquid is left. When the vegetables are nearly tender, stir in the mustard and then continue cooking without the lid to reduce the cooking liquid. Remove and discard the bay and thyme. Taste for salt and season with pepper. Meanwhile, for the parsley sauce, pound the garlic in a mortar with 1/4 tsp salt, the peppercorns, the fennel seeds, and 2 tablespoons of the parsley to make a smooth paste. If the mixture seems to dry to handle well, add a little of the olive oil. 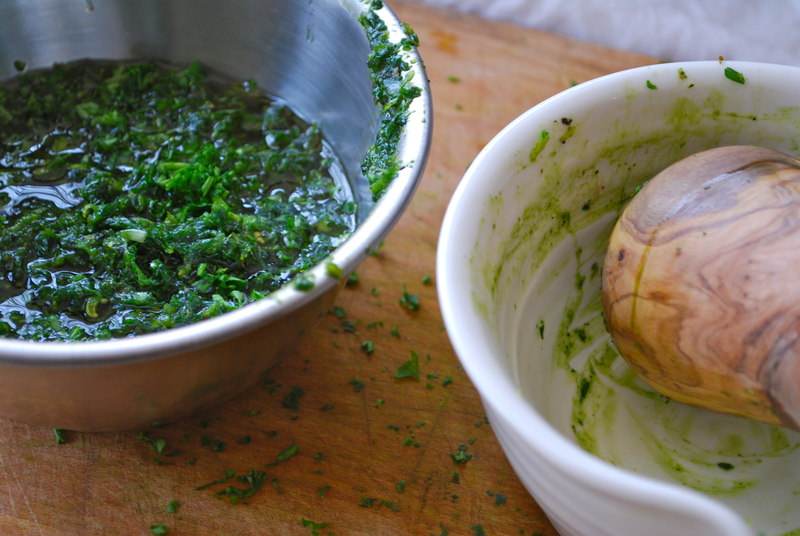 Stir in the rest of the parsley, the shallot, the lemon zest, adn the oil to make a thick green sauce. Taste for salt, then sharpen with a little vinegar. 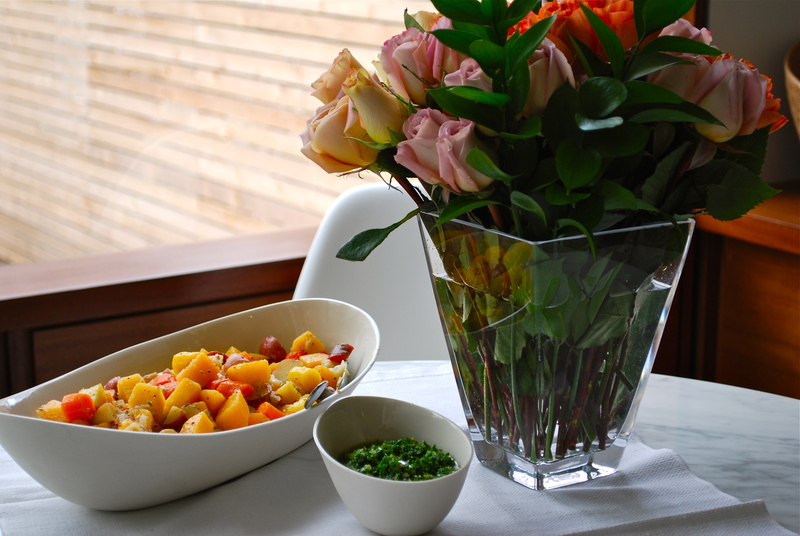 Serve the veggie stew as a side dish, or as a light dinner over rice or quinoa. However you serve it, finish each serving with a spoonful of the sauce or a scattering of minced parsley. The veggie stew can also become a soup with the addition of more liquid, or a puree with a spin in the food processor or a food mill. The sauce goes equally well with any iteration. Last January I featured the Creamy Triple Mushroom Gemelli noting that every winter season should have its own favourite mushroom dish. Back in January 2011 it was Winter Portobello Stew. 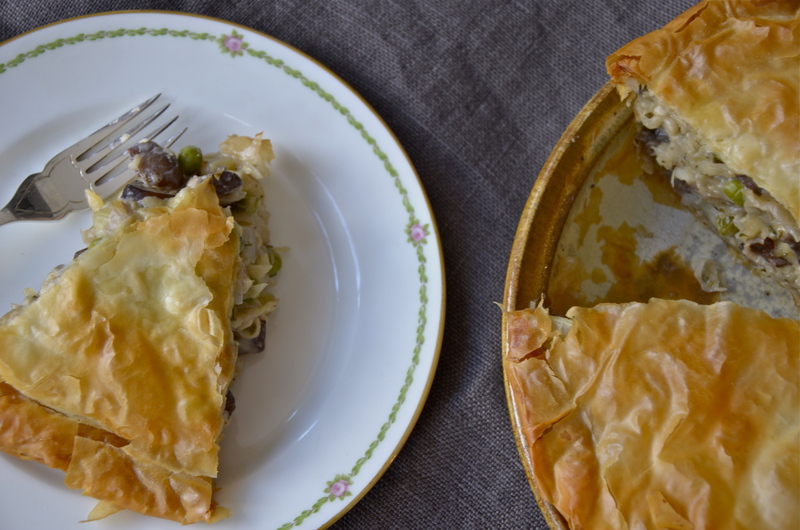 This January it’s this earthy, herb-infused mushroom tart with a beautifully browned flakey filo crust. 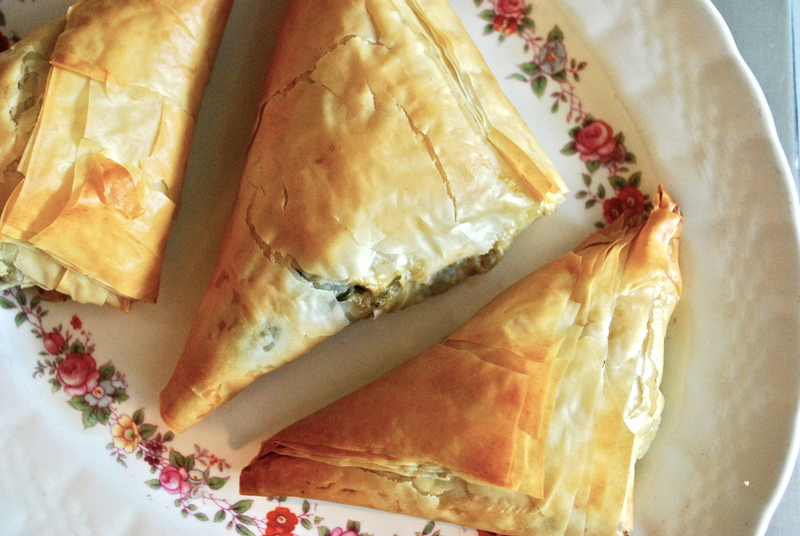 It’s pretty easy to make although filo is always a little finicky. But on a dark, cold Sunday afternoon with some good music on and a winter exilir in hand like the hot apple mull, who cares? Let it take it awhile while you warm yourself by the hot stove. In a large saute pan, heat oil over medium heat. Add mushrooms, celery, onions and garlic. Cook until tender. Stir in fresh thyme, marjoram, and rosemary. Scatter flour over all the vegetables and stir. Cooking for a few minutes, so that the flour has a chance to cook. Stir in wine and stock, then lower temperature a bit. Stir occasionally while the sauce thickens up. Stir in soy cream. Start adding salt and pepper. The amount will vary according to how salty the stock is and/or what your palette likes. Make sure to taste it along the way. Turn off heat and stir in grated potatoes and peas. Adjust seasoning again if necessary. Set aside to cool while prepping tart crust or place in fridge until ready to assemble. Brush sides and bottom of tart pan with olive oil. Place first sheet of filo dough across tart pan, then brush with oil. Make sure to brush the dough that is on the side of the pan. Rotate placement of the next sheet slightly down from the last sheet. Brush with oil. Like it is the minute hand going around the clock face. Continue with all eight sheets around the tart pan. 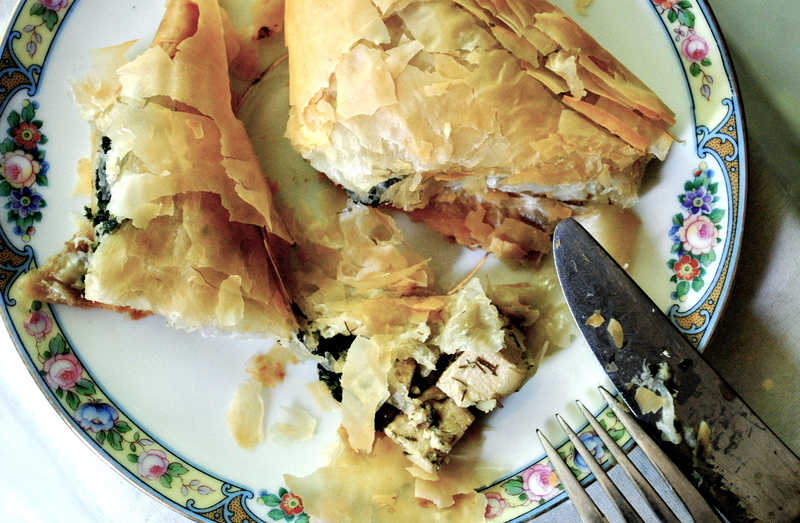 Make sure that the bottom, sides and edge of tart pan are all covered with filo and oil. Place filling in tart pan. 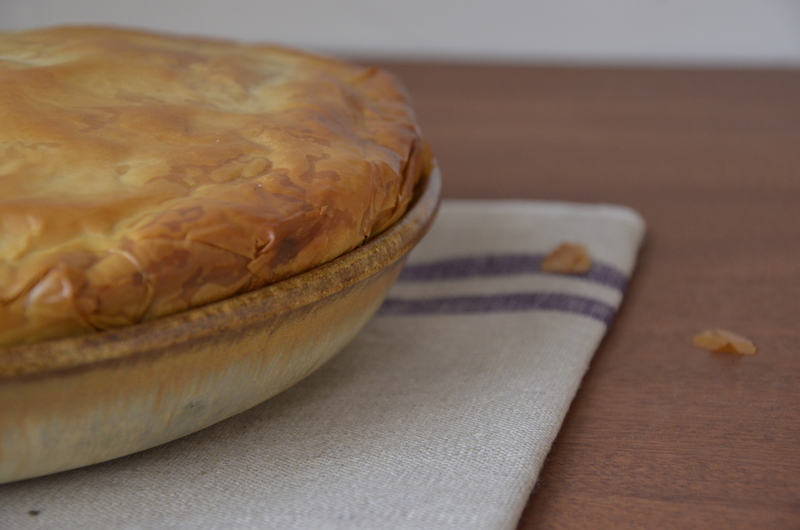 Cover tart with the next 8 sheets of filo in the same manner as the bottom layer. When finished, use kitchen scissors to trim edges, leaving a 1/2 inch over hang. Then go along edge and tuck edge into pan all the way around. Bake for 35-45 minutes until filo is golden brown. Remove from oven and cool a bit. When cool to the touch, release edges from tart pan with knife. Then invert on to a platter. Cut into wedges and serve. 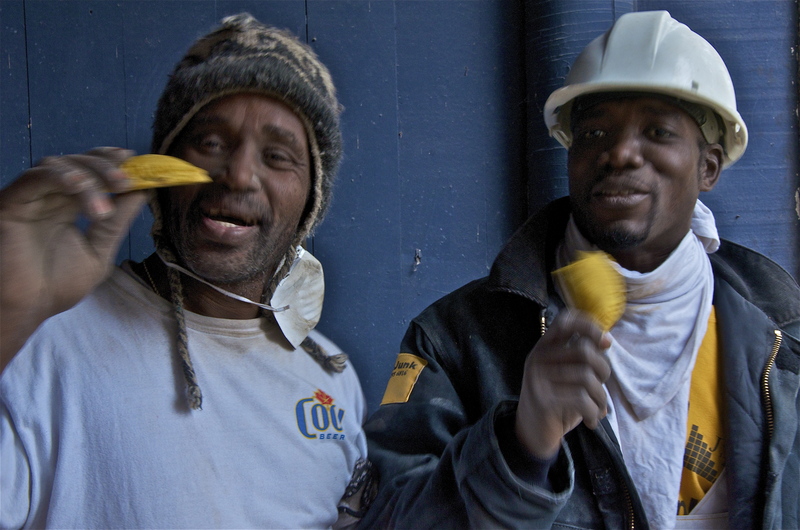 This is a bit of a long story … but the other day Sammy put in an order for Jamaican Meat Patties because he had them at a friend’s house and liked them. 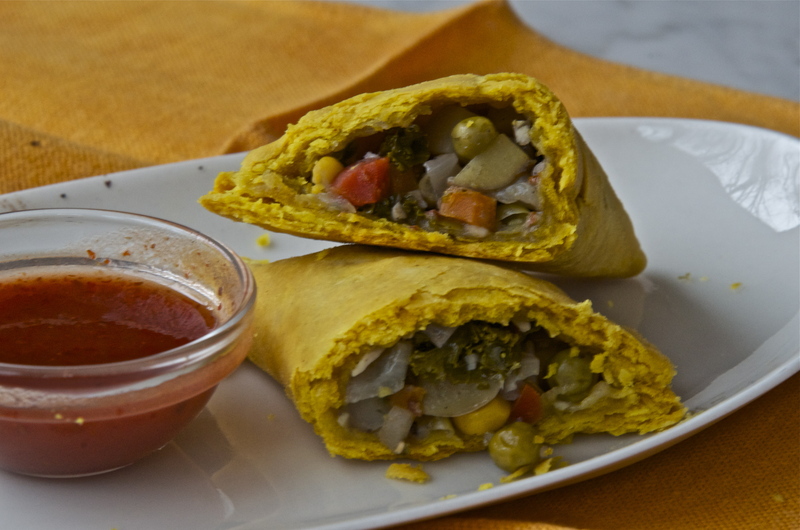 In soliciting suggestions for where to buy them in Toronto my friend, Pamela, challenged me to making my own Jamaican veggie patties. Of course I had to accept the challenge. So today I went out to get some ingredients and on my way back I bumped into my new buddies, Sam and Gordon, who are doing work on the house across the street. We struck up a conversation, I told them what I was up to, and they asked to be my official taste testers. Sam is from St. Vincent and Gordon is from Jamaica and I got 100% thumbs up from both of them which I take as a big endorsement. Sam even said he wasn’t dipping in the hot sauce because he only does that when the flavours aren’t good enough. Score. For the filling: In a medium-size saute pan over medium-low heat, combine the coconut oil, the onion, cinnamon, allspice, cumin, red pepper flakes, cayenne, and 1/2 teaspoon of salt. Saute, stirring occasionally, for 8 to 10 minutes, or until the vegetables are caramelized. Add the garlic and cook for an additional 2 minutes. Stir in the coconut milk, carrots, and potatoes, reduce the heat to low, cover, and cook until the carrots and potatoes are tender, 10 to 12 minutes. Stir in the green peas, corn, cabbage, thyme, and lemon juice, cover, and cook for 3 minutes more. Season with additional salt and the white pepper (or to taste) and set aside to allow the flavors to marry. For the pastry: Combine 1 1/2 cups of the white flour with the pastry flour, turmeric, and salt in a large bowl and mix well. Set the remaining 1/4 cup white flour aside. Add the coconut butter to the flour mixture and rub with your fingertip until the mixture resembles fine sand, about 10 minutes. Combine the vinegar and water and mix well. Then, without overworking the dough, add the vinegar mixture by the tablespoon, while stirring, just until the dough comes away from the sides of the bowl and begins to coalesce. Squeeze into a tight ball, flatten, cover in plastic wrap, and refrigerate for at least 1 hour. Preheat the oven to 350F and remove the dough from the refrigerator. With the reserved flour, lightly dust a clean surface, roll out the dough until it is about 1/8 inch thick. Cut six 6-inch circles from the dough (you can use a bowl). Spoon 2 heaping tablespoons of the filling onto the center of one side of each circle, leaving about a 1/8-inch border. 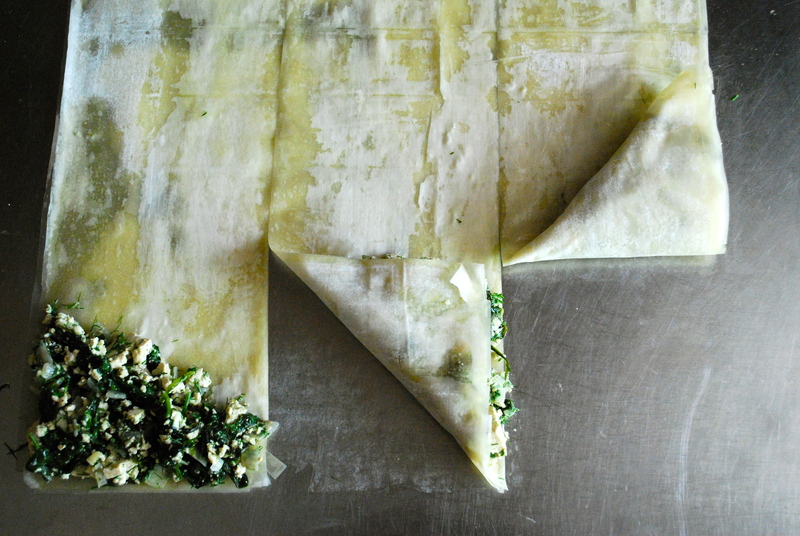 Fold the other half over to make a half-moon, press to seal, and make ridges around the edge using a fork. Transfer the patties to a parchment-lined baking sheet and bake until golden brown, about 35 minutes. Serve immediately with some hot sauce. I was reorganizing the kitchen the other day and found a few small size format cookbooks that had gotten lost at the back of a shelf. One was 200 Veggie Feasts by Louise Pickford that my son gave me for Christmas 2 or 3 years ago. It’s a little gem I have to say, and is the inspiration behind these jeweled yam and mushroom wontons. Pickford’s were a little simpler – no onion or yams. But I decided to amp them up a bit and throw in a little extra heft. Just make sure when you are buying your wonton skins you look at the ingredients label to see if they have egg if you want to go the full vegan route (Twin Marquis is a brand that makes both vegan and non-vegan wonton skins). And of course with the basics in hand you can make different shapes, different filings, for different dishes from soups to little appetizers. Heat olive oil in a heavy skillet. Add the onions and cook until they start to turn translucent. Add mushrooms and yams and cook over medium heat until they become soft. Add garlic and ginger and cook for a few minutes more until garlic becomes fragrant. Add soy sauce and cook, stirring, for another minute or two. Remove from the heat. Allow to cool. Meanwhile, make the dressing. Put all the ingredients in a saucepan and heat over a low heat, stirring until hot but not boiling. Keep warm. 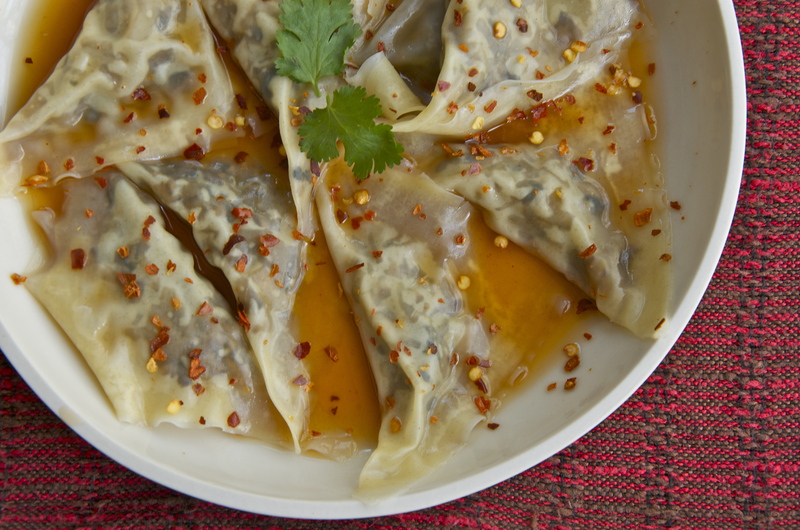 Put a teaspoon of the mushroom mixture in the centre of each wonton skin. 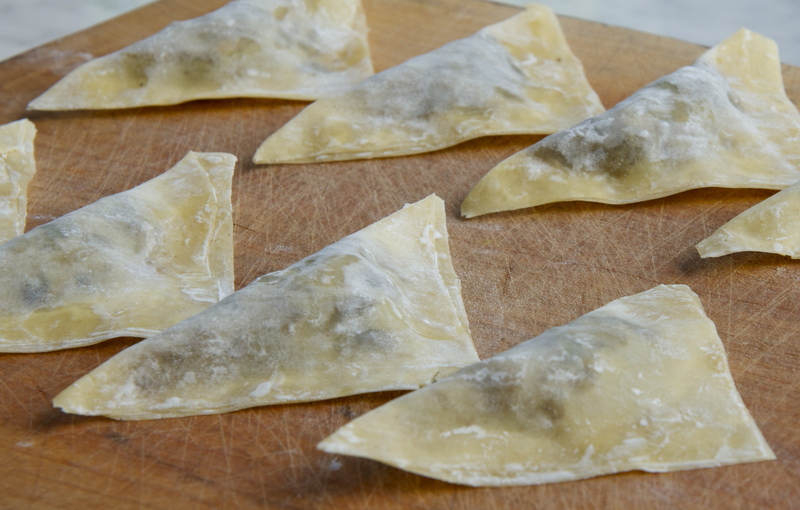 Brush a little water around the filling and fold the wontons in half diagonally, pressing the edges together to seal. Bring a large saucepan of lightly salted water to a rolling boil, add the wontons, and cook for 2 – 3 minutes until they rise to the surface. Remove gently with a slotted spoon and transfer to warmed serving bowls. Drizzle liberally with the chili dressing and serve immediately. This recipe was a labour of love – a well-researched-much-adapted-tested-and-tested-again-totally-worth-it labour of love. It’s awesome with chana masala, some simple naan, and rice. It really doesn’t have to be more complicated than that. 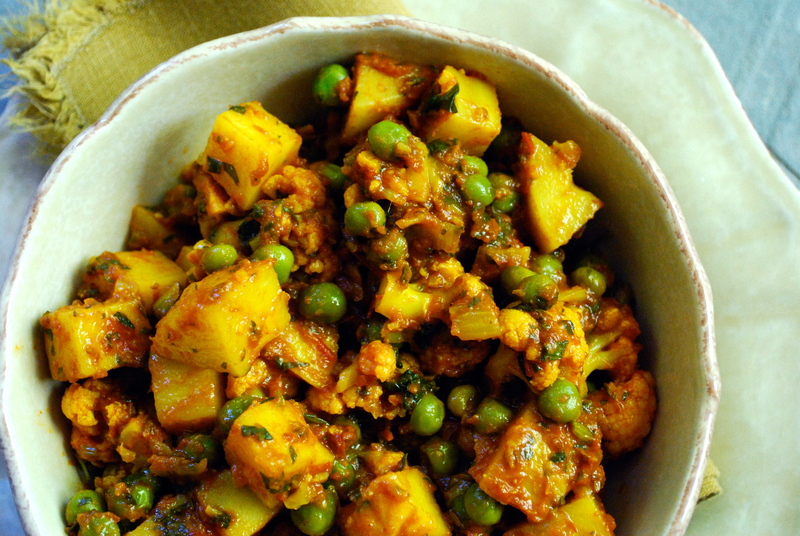 I wish I could tell you more about the history of aloo gobi but all I know is that it’s usually a dry dish containing potatoes, cauliflower, and turmeric as the signature ingredients, and it hails from Punjab in north-west India. I don’t like mine so dry so I add stewed tomatoes. And it rocks. Which I guess is all you really need to know. Heat olive oil in a heavy-bottomed pot or dutch oven over medium-high heat. Add onions and sauté until softened, about 5 minutes. Add whole cumin seeds and cook until they pop and sizzle. Add minced garlic and ginger and cook for another minute or two. Stir in turmeric, garam masala, and cayenne. Cook until fragrant but be sure not to burn the spices; about 1 minute. Stir in salt, stewed tomatoes, cauliflower, and potatoes. Cook with the lid on until the potatoes and cauliflower are tender, about 15 minutes, stirring often. If it gets too dry, add a little bit of water. When the potatoes and cauliflower are tender, turn off heat and add peas. Put the lid back on and let the peas steam in the residual heat; about 1 minute. Adjust seasoning with sea salt and pepper. Add chopped cilantro and serve piping hot.